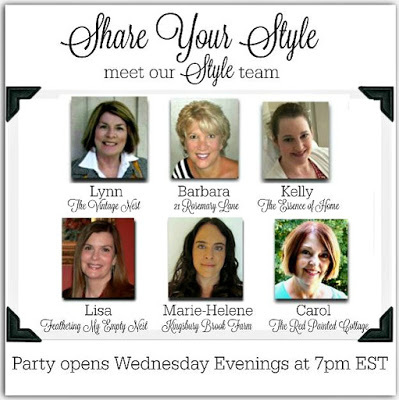 Welcome to the 123rd Share Your Style party. Always happy to have you and so much fun to see your inspiration. This is the view in front of me as I write this post today. On vacation and enjoying the surf, sand and sea and some of those fancy umbrella drinks :) . I am Lynn, author of the blog The Vintage Nest, and I will be your host today if I can keep my eyes from gazing out the window. 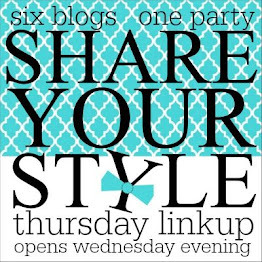 Remember there are six hosts at the SYS party so your blog will get lots of exposure. Mary, of the blog, Orphans With Makeup, shared a fabulous furniture makeover...a dated secretary...I am such a fan of cottage charm and this just fits right in with that sweet style. Summer time is here and we still have to eat but who wants to spend time in a hot kitchen. And finally, I couldn't let this post go by with mentioning Father's Day. My husband, my Dad and both my sons and grand-daughters love to fish and Dining Delight has a totally delightful fish theme table setting...... so much inspiration and ideas here. Thank you for joining us today and if you were featured please copy and paste the badge below into your blog. Please remember to add a link in your post back to the party so others can find us and visit your neighbors. All family friendly posts are welcome but please don't link up the same post for one year. Thanks so much Lynn for hosting and choosing to feature my Fishing Themed tablescape. Nice to hear that so many in your family enjoy fishing! Hope you enjoy your vacation to the max - lovely view! Thanks Kelly for co-hosting the 123rd Share Your Style. Have a great week.